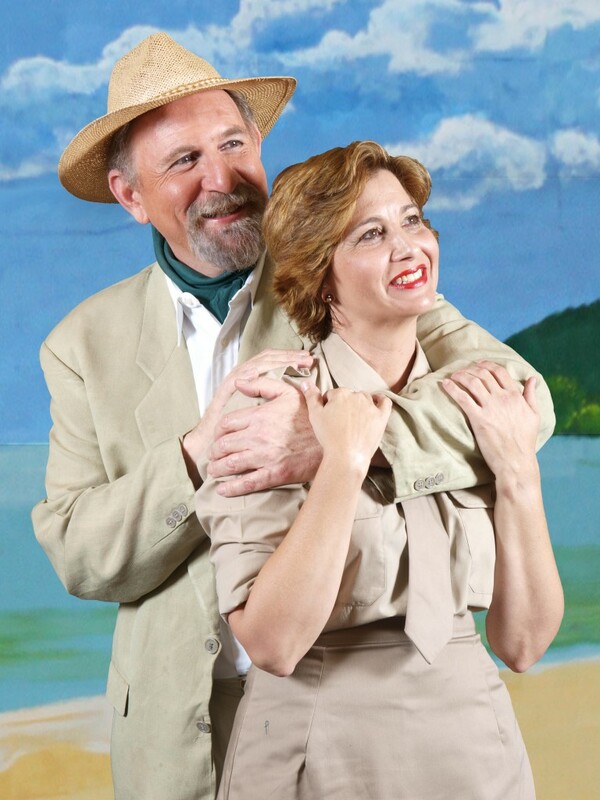 Here are a couple of clips of me appearing as Emile de Becque in a recent production of “South Pacific”. So many thanks to my great partner, Tamar Naggan. Several regular readers of SoTW were gracious enough to write and ask why there were no postings for the last two weeks. The reason is that I went to the Old Country to bury my mother, Claire Mitchel. I’m back, and I can’t say it’s easy to talk about music. I’m in a very dark and depressed place, as those of you who have been through this will understand, with no taste for mirth or fun or entertainment. Not even for music. But in the five days since I’ve returned from the proscribed mourning period, I’ve been reluctantly thrown back into the Musical mode. 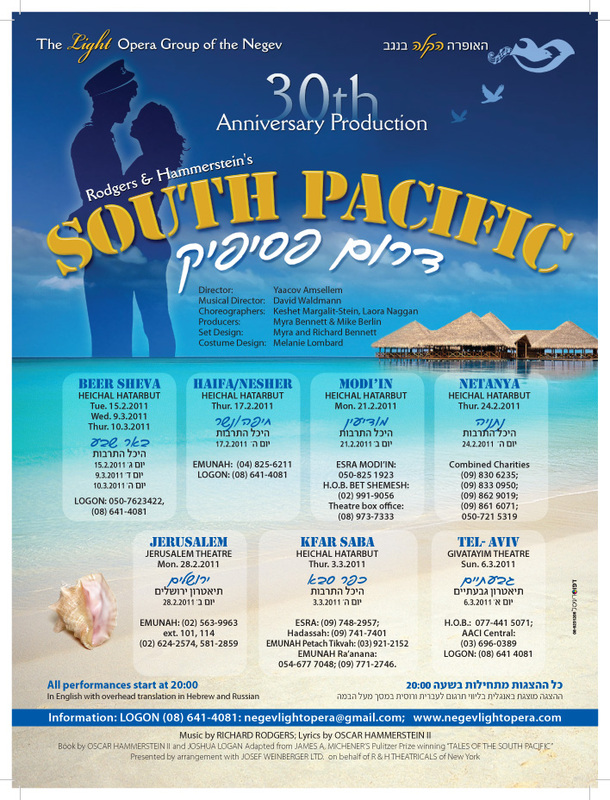 In September, I joined the Light Opera Group of the Negev for their annual production, which this year is Rogers & Hammerstein’s “South Pacific“. I’ll be playing Emile de Becque, the male lead. Rehearsals have been going on for five months now, with less than a month to go before the premiere, on February 15. So my mother chose a most inopportune time to die – demonstrating clearly how much stronger and inexorable real life is than even a classic Broadway musical. 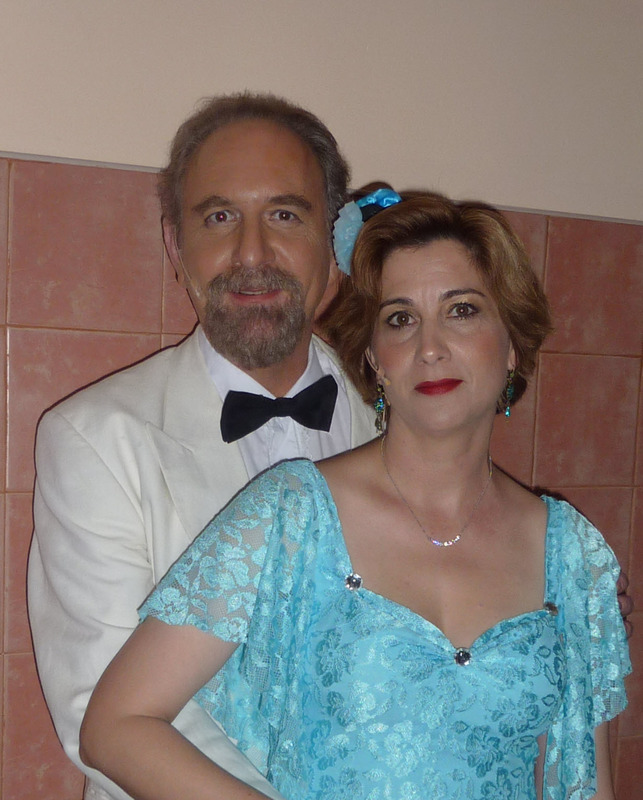 It’s a big production – 50 people on stage, costumes, scenery, dances, a live orchestra. A big show is a lot of work, and spectacle requires a tremendous investment. For me, it’s a great opportunity to try something new. I had taught acting for many years prior to this, but had actually very little experience on the other side of the footlights. I’ve found the job of building a character a challenge and a pleasure, due to no small degree to my wonderful partner in the role of Nellie Forbush, Tamar Naggan. My role also requires a lot of singing in an uncomfortably high register for me, so I’ve been working hard at preparing my voice. They’re even trying to teach me to dance a bit, refusing to accept the principle of the ineducability of senior canines. I had a hard time tearing my mind and my heart away from all this sound and fury when Mom started dying a few weeks ago, and I’ve had no less a hard time getting back on track. I haven’t yet, actually. I’m on automatic pilot—the hands gesture, the voice declaims, but the heart is very much elsewhere. But the show must go on, as they say, and I get myself to rehearsals every night. And I assume that sooner or later the roar of the greasepaint and the smell of the crowd will sweep me up and away. I had been hoping to show some pictures or even clips of the show to my mother. I told her about it, and she was mildly interested; but in recent months she hadn’t really had the energy to really focus on much of anything. If I had appeared in a show like this two years ago, she would have been bragging all over Southern Florida. My mother was as good an audience for “South Pacific” as you could find. She was diapering me when the show opened just over 60 years ago, the heyday of the classic Broadway musical. The show is set in WWII, as was my mother’s life. She was pushing my sister’s pram while my father was playing GI Joe at Normandy and across Europe. conjure the sound of her approximating “Summertime, and the living is easy…” Granted, that’s a tough tune to carry, and she did try. Very hard, to the chagrin of my sister and me in the back seat. She also pounded the piano a bit, more than we would have liked. But to give due credit, my mother did expose me to music. She sent me for piano lessons, which I typically dismissed at the time. But twenty years later I was exploiting every drop of understanding of chord structure I had garnered from my teacher, thankfully an entertainer in a bar rather than a stodgy old maid. I sing passably well–even professionally on occasion–and if I can’t credit my mother with my ear or my chops, I must admit that she always did express how much she liked hearing me sing. Growing up, I never had much use for the music of the musicals, the Great American Songbook, the ‘classics’ of the era from post-WWII till Beatlemania. When you have ‘Good Vibrations’ and ‘The Weight’ and ‘Lady Madonna’, who needs ‘There is Nothing Like a Dame‘ and ‘Bloody Mary’ (the sailors); ‘I’m Gonna Wash That Man Right Outa My Hair‘, ‘I’m in Love with a Wonderful Guy’, ‘Honey Bun‘ and ‘A Cockeyed Optimist‘ (Nellie and the nurses); ‘Some Enchanted Evening‘ and ‘This Nearly was Mine‘ (Emile); ‘Dites Moi’, ‘Bali Ha’i‘, ‘Happy Talk‘ and ‘Younger than Springtime’; all well-known hits in their time from “South Pacific”? It was only in recent years, when I became intensely interested in improvisatory jazz from the 1950s, that I really appreciated my subliminal knowledge of all those standards – to which I knew all the words of all the verses, including the bridge, including the intro – thanks to all those years of 1950s musical osmosis that were going on in our home. 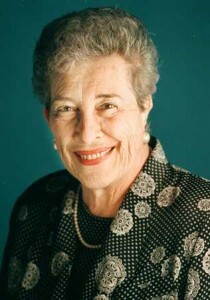 After she finished raising our organic family, my mother became a woman of accomplishment, as an activist in the War on Poverty in the 1960s, a spokesperson for women’s rights in the 1970s, and most notably as a successful writer for the Miami Herald, with a very popular weekly column that lasted for 24 years describing the lifestyle of senior citizens, The Third Third. Here’s the paper’s obituary, and here’s a tribute. She died peacefully at 89, having lived a very full life. For our Song of The Week, then, we’re offering up the original version of “Some Enchanted Evening”, the signature song of South Pacific. Emile, a widowed French plantation owner on a South Sea island, has met Nellie, a vivacious young nurse from Little Rock serving in the US Navy. There’s a war going on, but (or perhaps ‘so’) they fall in love immediately (‘Some enchanted evening, you may see a stranger across a crowded room’). When Americans of a certain age hear the phrase ‘love at first sight’, the refrain of ‘Some Enchanted Evening’ immediately starts playing in the background of their minds. It’s that iconic. She refuses to marry him, however, because his late wife was Polynesian, and she’s from Arkansas, and this is 1950. I’m not going to reveal any more about the complications and resolutions. If you’re curious, you’re just going to have to fork out your 80 or 90 shekels and come see for yourself. “South Pacific” opened on Broadway in 1949. It was written by Rodgers and Hammerstein, preceded by “Oklahoma!“, “Carousel” and followed by “The King and I” and “The Sound of Music“. 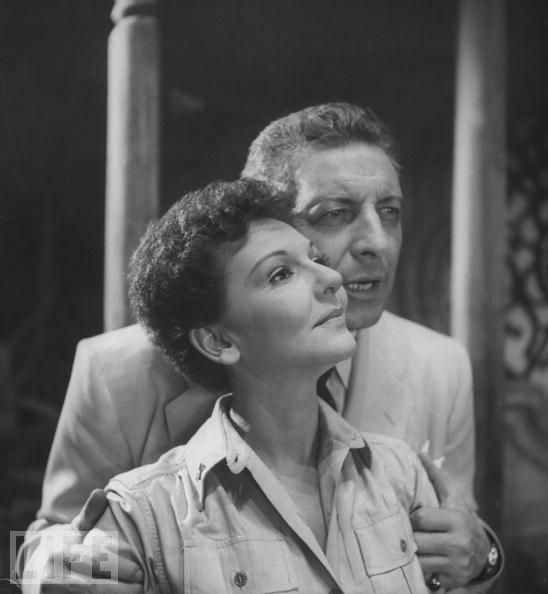 “South Pacific” starred Mary Martin (she had already sung the original version of ‘My Heart Belongs to Daddy’, and went on to star in the original Broadway productions of “Peter Pan” and “The Sound of Music”) and Italian opera star Ezio Pinza. It ran for five years. Since the original Broadway production in 1950, the show has had innumerable revivals. Two notable recent ones are the 2008 Broadway revival starring Kelli O’Hara and Paulo Szot; and the knockout 2005 Carnagie Hall concert version, my favorite, starring country singer Reba McEntire and Brian Stokes Mitchell. 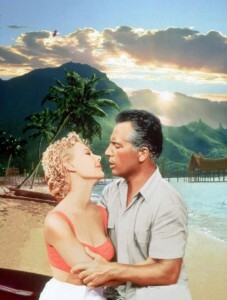 And here’s a clip from the stodgy, well-known film version (1958, with Mitzi Gaynor and Rossano Brazzi) which truthfully hasn’t aged too well. The show continues to be widely performed in both professional and amateur productions. 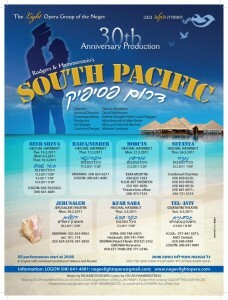 LOGON will be giving nine shows around Israel, from February 15 till March 10. You’re welcome to come see it. My mother won’t be there. I imagine she would have been very proud to see me singing ‘Some Enchanted Evening’ in my white tuxedo. But she’s not going to have that chance. I know that she’ll be on my mind when I go on stage, and that won’t make my job any easier. But I’ll give it my best shot, make my every effort to do something creative and singular, which is the lesson and the legacy that she’s left me. Thank’s un ha guite shabes. Indeed, I can understand you perfectly, you know that. I wish you every success in the campaign and I can only say that your mother achieved enjoy every moment and every scene because the body is no longer an impediment to it now. Is her soul that observes, her heart will always be with you. In this work and all. Let music accompany the healing of your soul, find your sophisticated version of Avi Bitter. Great pic, never seen you without glasses before. Looking forward to see you on stage. a wonderful, personal column. thank you for sharing your feelings with us. A beautiful post, Jeff. Know that the whole cast is out there hurting for you, and pulling for you. May you be comforted among the mourners of Zion….. Beautifully written. You’re doing a wonderful job. Dear Jeff: Let me be your mom’s understudy for opening night. friend. She’ll be there in spirit, doing an excellent critique!